There's a reason why there's a Scorpions song called "Rock You Like a Hurricane." Hurricanes have the potential to do colossal damage. They are not to be underestimated. Now that hurricane season is well underway, those situated in the path of most Atlantic storms are bracing themselves for the big one. Could Joaquin be it? Late Wednesday night, Hurricane Joaquin was upgraded to a Category 3 storm and is expected to reach Category 4 on Thursday night. If you're dismissing Joaquin as just another tropical storm that will dissipate before it hits landfall, then I suggest you put on "Rock You Like a Hurricane" and take a look at these ominous-as-hell Hurricane Joaquin GIFs that illustrate its brutal wrath. Joaquin was already measuring 115-mph winds as it became a Category 3 storm on Wednesday night, but it's only going to continue intensifying. 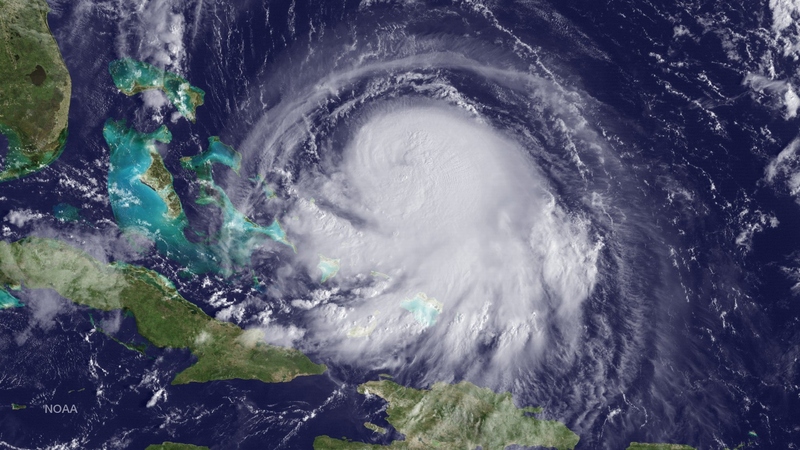 Though meteorologists are still uncertain whether it will reach land, they have issued hurricane warnings in the Bahamas, where Joaquin is expected to pass over or near Thursday night. AccuWeather forecasters predict that Joaquin will cause major waves, strong winds, and flash flooding in the central Bahamas, and are advising residents to prepare accordingly. I know what you're thinking: "But what does this have to do with me?" Well, if you live on the eastern coast of the U.S., then you might want to check yourself before Joaquin wrecks yourself. It could be a significant situation. Everyone along the Northeast coast, right up to New England, should keep a close eye on the forecasts. That's right — New England. There is going to be catastrophic flooding from North Carolina to Massachusetts, and this is going to disrupt the economy regardless of whether or not Hurricane Joaquin makes landfall. If you're still not convinced by these weather experts' forecasts, then perhaps a visual warning will really drive the message home. These terrifying Hurricane Joaquin GIFs will definitely get you to take the situation seriously. Does that not look just like a swirling hell? There it goes hurling itself into the eastern side of the U.S. It's just as scary in black and white. Staring at the dark eye of the storm is oddly hypnotizing. If you squint, you can see Satan. That is perhaps the scariest one of them all.